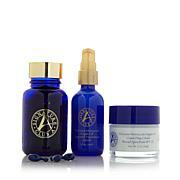 Collection of Vitamin C infused beauty products designed to help rejuvenate your skin. No need to tug on delicate skin. Ingredients: Active Ingredients:Octinoxate 7.50%, Oxybenzone 6.00%, Octisalate 5.00%, Avobenzone 3.00% Inactive Ingredients: Acrylates/C10-30 Alkyl Acrylate Crosspolymer, Ascorbyl Palmitate, Butylene Glycol, Butylparaben, C12-14 Alkyl Benzoate, Calcium PCA, Cetyl Alcohol, Cyclohexasiloxane, Cyclopentasiloxane, Dimethicone, Disodium EDTA, Ethylhexyl Palmitate, Ethylparaben, Fragrance, Glycerin, Glyceryl Stearate SE, Honey, Isobutylparaben, Isostearic Acid, Magnesium Ascorbyl Phosphate, Methylparaben, Mica, Octyldodecyl Neopentanoate, Orange 4, PEG-100 Stearate, Phenoxyethanol, Phospholipids, Pollen Extract, Propolis Extract, Propylene Glycol, Propylparaben, PVP/Eicosene Copolymer, Retinyl Palmitate, Royal Jelly, Silica Dimethyl Silylate, Sodium Hyaluronate, Steareth-20, Titanium Dioxide, Tocopheryl Acetate, Tridecyl Salicylate, Triethanolamine, Water, Yellow 5, Yellow 6. Ingredients: Water, Caprylic/Capric Triglyceride, Glycerin, Tridecyl Stearate, Neopentyl Glycol Dicaprylate-Dicaprate, Tridecyl Trimellitate, Stearyl Alcohol, Fragrance, Ceteareth-20, Myristyl Myristate, Glyceryl Stearate, Dimethicone, Carbomer, Citrus Medica Limonum (Lemon) Extract, Zea Mays (Corn) Oil, Retinyl Palmitate, Cholecalciferol, Retinol, Triethanolamine, Titanium Dioxide, Ascorbic Acid , Disodium EDTA, Sodium Benzoate, Methylparaben, Propylparaben, Diazolidinyl Urea, Yellow 5. 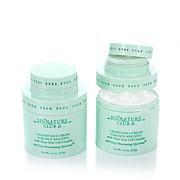 Ingredients: Water, Glycine Soja (Soybean) Protein, Propylene Glycol, Cyclomethicone, Glyceryl Stearate, PEG-100 Stearate, Propolis Extract, Magnesium Ascorbyl Phosphate, Sodium Polystyrene Sulfonate, Honey, Royal Jelly, Hydrolyzed Elastin, Tocopheryl Acetate, Triethanolamine, Polyacrylamide, C13-14 Isoparraffin, Laureth-7, Ascorbyl Palmitate, Methyldihydrojasmonate, Cetyl Alcohol, Carbomer, Disodium EDTA, Imidazolidinyl Urea, Diazolidinyl Urea, Methylparaben, Propylparaben, Yellow 5, Red 40. 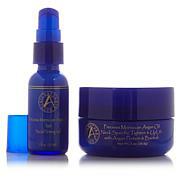 Adrien Arpel is so informative and well educated in regards to skincare and the ingredients that work. She does her research and is absolutely the most informed. This product is exactly what I want---INSTANT Results!! Adrien knows!! So, some of the products had leaked in the box and some definitely had an old product texture. But I decided to keep it because I have loved the products in the past. I didn't like the "meltdown cleanser" at all -terrible underlying smell but the real surprise came when I put the AM products on the next day. I have always loved the "ounce of gold" but it also seemed drier than it used to and I had to take it all off after a few hours. My eyes were burning and watering. Bad batch for me.